Okay, i will not talk about the presentation of the materials of the product. Suffice it to say that if you have recent Rmax releases from TACFIT Commando onwards, you would find the presentation format familiar. 2. Joint mobility instructional and follow along videos. 3. Training proper instructional and follow along videos. 4. Compensatory movements instructional and follow along videos. I have not reviewed in detail the joint mobility and yoga portions so i won't cover that here. I'll go straight to review the meat of the program, the training proper (called Flow Physique in the program). Flow Physique is a series of 6 programs, using each of the 6 TACFIT Protocols. There was some discussions some time ago on the Rmax Forums on how to use Commando movements with the 6 Protocols. So this is an answer to that question. Protocol 1 is almost a carbon copy of TACFIT Commando Mission 1. It is 20/10 x 8 with SIX exercises. Protocol 2 has more locomotion drills than the original TACFIT 26 or TACFIT Firefighter First Alarm (TFFA). There are three locomotion drills (also called Mat Relay) here. Protocol 3 is almost a carbon copy of TACFIT Israeli Challenge. However the prescribed number of reps is dropped from 6/6 to 4/4. Protocol 4 prescribes only 5/5 reps per exercise. No more 21-13-8-5. Protocol 5 is the first time Pull Ups appear in the program. Protocol 6 is a bodyweight version of TACFIT Foxtrot. There are three levels of Sophistication instead of four. Overall, the some exercise progressions seems more basic than those in TACFIT Commando. On the other hand some exercises, start at a higher sophistication level than those in TACFIT Commando. However that does not stop you if you like to increase the Sophistication below or above the prescribed levels. Most of the exercises are familiar to CST / TACFIT practitioners. There are some new variations and some new movements in some programs. 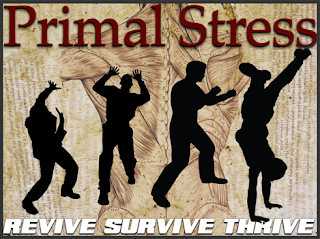 Click here to purchase Primal Stress. Click here to purchase TACFIT 26. Click here to purchase TACFIT Firefighter First Alarm. Click here to purchase TACFIT Commando.